I wrote this essay in the summer of 2016, and spent the ensuing year revising it. Yet I never hit publish. Partly, I felt (and feel) like an imposter; neither Bloch’s work nor WWII are within the purview of my own historical research. Additionally, I’m not sure I entirely agree with my conclusions about the role historians must play in this current moment. However, I just read the following piece (“The Medievalist Who Fought Nazis with History”) on Forbes.com, and I decided to share this because I do believe that Bloch was telling us more than “the point of history [is] to have something to say about the present.” So I offer my own thoughts for debate. Recently, I found myself reaching for my well-worn copy of Marc Bloch's The Historian's Craft, a 200-page meditation on the meaning and value of history and a primer on how to do it well. The book has a tragic backstory. Marc Bloch was a French Jewish historian who was well known and respected for his scholarship on medieval and early-modern French feudal society. After Nazi troops invaded France in 1940, Bloch went underground and began to work on two manuscripts. He wrote the first, Strange Defeat, during the summer of 1940 to chronicle how and why France failed to rout the German invasion. Bloch then began writing The Historian's Craft. In late 1942, while working on the manuscript, he became active in the French Resistance. Vichy police eventually captured him in March of 1944 and he was turned over to the Gestapo for interrogation. He was tortured, imprisoned, and then murdered by a firing squad in June 1944. Bloch's colleague, historian Lucien Febvre, took up the task after the war of assembling the unfinished text into a draft for publication. The Historian's Craft thus begins with a quote from Bloch's son, who as a young boy asked of his father, "Tell me, Daddy. What is the use of history?" Bloch explained that buried in this simple question posed by his child lay a deeper question, "no less that of the legitimacy of history.” [ii] From the outset, then, Bloch devoted The Historian's Craft to explaining the "usefulness" of history as an intellectual discipline devoted to understanding human lives. Bloch emphasized that “useful” history portrays people, events, and decisions in the past as complex and dynamic, the product of coincidences and contradictions just as often as of logical choices. Bloch thus concluded the introduction to The Historian’s Craft by describing it as “the memorandum of a craftsman who has always liked to reflect over his daily task.” [v] Indeed, “reflective” perfectly describes the book. It is quiet and wise. In a time of chaos, Bloch bored down to examine the nature of history and the essential mechanics of historical research. And yet by focusing on the foundations, Bloch also challenged historians to think more broadly about the judgments they built atop it. Are historians to blame for the ease with which politicians flatten history? We must ask ourselves how and why history is so easily dismantled and rewritten by politicians, while our scholarship is dismissed. Have our attempts to prove our contemporary relevance led us to pass too many judgments and ironically led us to undermine our own legitimacy? These moments of inertia are when it’s most tempting to assert our usefulness by putting judgment before explanation. Bloch urges us to look inwards at our own methodological practices. Not because it will challenge the new regime, or instantly make American society more empathetic, but because it is a balance against the loud, the chaotic. It’s a forceful assertion of the importance of reflection and humility. [i]Marc Bloch, The Historian’s Craft: Reflections on the Nature and Uses of History and the Techniques and Methods of Those Who Write It (New York: Vintage Books, 1953), 4-6. Last week I had the pleasure, for the first time in months, of spending a day in the archives. With the financial support of the Southern Jewish Historical Society, I was able to travel to New Orleans and conduct research Tulane’s Louisiana Research Collection. I prepared for my visit using the DEVONthink for Historians Smash and Grab Checklist, a template that Ada and I designed and included in Super User guide (we also have a Low and Slow Checklist for longer-term archival visits). We created these checklists because our philosophy is that database maintenance is as important as database mining. It’s like a car—you can’t drive it if you don’t change the oil regularly. 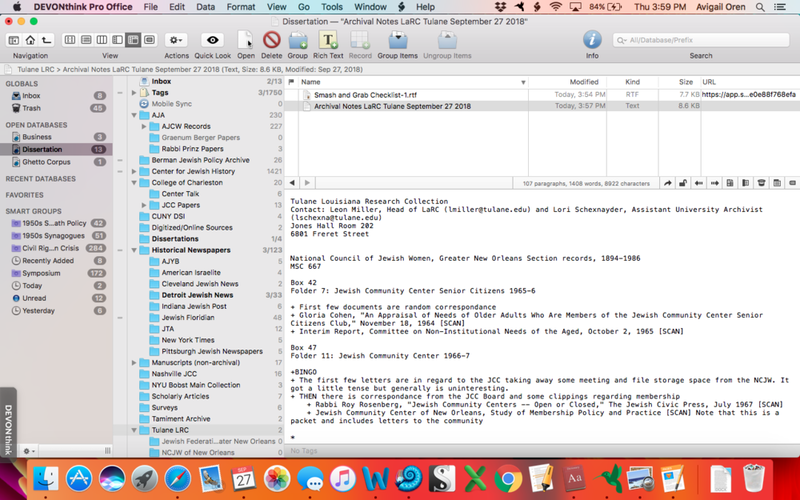 Per step one, I created a new plain text file within the same folder and labeled it “Archival Notes LaRC Tulane September 27 2018.” I added contact information for the archivists I had corresponded with, the address of the archive, and then listed the collections, boxes, and folders I planned to view during my visit. And then I headed for the airport! I woke up early so I would have time to double-check that my database, scanner app, and walking directions to the archive were set and that I was ready to go. I arrived at the archive a few minutes after it opened, delayed by a deluge of rain that slowed my pace. By the time I reached Tulane I was soaked! But between 10:30 AM and 3 PM, I diligently combed through boxes and folders. As instructed in the “In the Archive” section of the checklist, I kept a dutiful record of the materials I viewed. 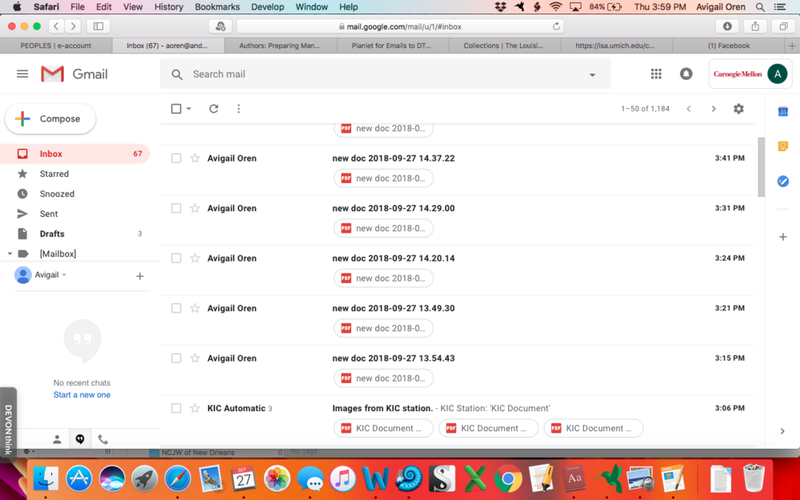 In my archival notes, I wrote down the contents of each folder (in the aggregate, unless particular documents were of interest) and indicated if I had scanned a particular document. I used the CamScanner app to create PDFs of each document. I like CamScanner because it has a batch feature that allows you to capture a multi-page document in one PDF (other apps might do this as well, but this was the first one I found). From the app, I transfered the PDFs to my laptop via email. This could also be done with a cloud storage service. Before I left, I downloaded and opened each file to check that the PDF was readable and complete. When you can’t necessarily get back to an archive, it’s essential to do the job right the first time. It’s hard when you’re mentally drained and your eyes are itchy and tired and all you want is to go eat a big lunch and nurse a beer. But I forced myself to do it! My first post-archive task, per the checklist, was to transfer all of the PDFs into the database and move them into their appropriate folders. I ended up only scanning 10 documents, and so I had time to do this before the archive closed. With so few documents, I decided that box and folder sub-folders were not necessary and I simply stored the documents by collection. After a few days of enjoying the Big Easy, I sat down to finish the checklist. I added tags to each document, which varied; I did tag all with the year they were written and “New Orleans” so that I could easily aggregate all my documents from the Crescent City regardless of which archive they I found them in. Once the document was tagged I created a SuperAnnotation and filled in the citation information. The final step was to label both the document and SuperAnnotation with the red dot, which I’ve assigned to mean “To Do”—it’s a reminder to come back and take notes about the document’s contents. The Smash and Grab Checklist kept me organized on this whirlwind research trip by spreading out the work across three days. It kept me accountable and on-track with my database maintenance, and relieved the decision fatigue that often sets in during work travel. I just did what the steps instructed, and when I finished all of my new documents were in my database, tagged and together with their citation information. On past trips this has not always been the case! I feel like I’ve earned my Super User bona fides. If this nine-point, step-by-step checklist seems like it could be useful to you during your archival trips, become a DEVONthink for Historians Super User. 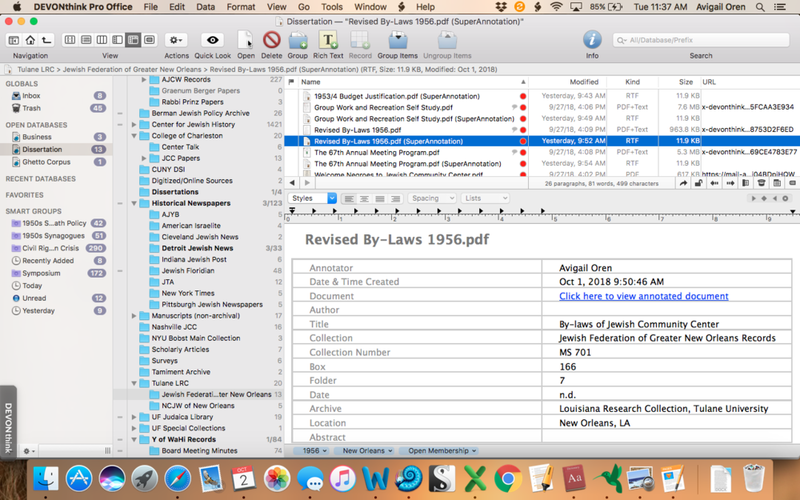 The guide includes 100 minutes of video lessons, the SuperAnnotation template, and a script that transfers your citation information to Bookends, a reference management software.